When in need of a space-saving seating solution that is either permanent or temporary, stack chairs have been proven to be beneficial. Stack chairs are a popular choice for many businesses that include hotels, schools, restaurants, cafeterias, and offices. 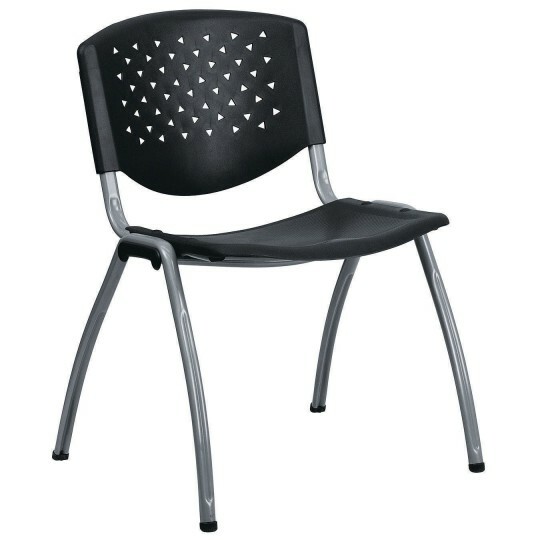 This chair features a perforated back to provide airflow to the lumbar area. The textured seat ensures safe and comfortable seating. This versatile chair is ideal for both indoor and outdoor functions. With the ability to quickly store the chairs, it allows for the space to be used again for other purposes or when cleaning is needed. This heavy-duty plastic stack chair is sturdy in construction to withstand regular use and frequent stacking. To make transporting even easier, equip yourself with the appropriate sized stack chair dolly.